LONDON: Chief Justice of Pakistan Supreme Court Mian Saqib Nisar has categorically stated that no charity or any organisation whatsoever is authorised and allowed to collect the donations and deposit in their bank accounts. “Only official bank account with the state Bank of Pakistan is only proper account to deposit the donations dedicated to the construction of dams”, he said this while talking to ‘The Nation’ in a formal chat. His attention was drawn towards a TV announcement in which a charity had asked the people to donate to its direct account. “No such authority or permission has been granted to this effect and people should donate only authorised bank account”, Chief Justice affirmed. Around five fund raisers were held in London, Birmingham and Manchester during which over six million pounds were collected for the construction of Mohmand and Dia Meer Bhasha dams. The last event was held under the auspices of World Congress of Overseas Pakistanis (WCOP) on Monday and £1,289,751 were collected for the purpose. Bestway Group’s Chairman Sir Anwar Pervez and CEO Zameer Choudhry CBE were present there and they announced 15 crore rupees (about 0.9 million pounds) for the project. Zameer Choudhry CBE, Chairman Naheed Randhawa, former chairman Syed Qamar Raza and Majid Choudhry also addressed the event while Rahim Jung moderated the proceedings. Earlier, UK-Pakistan Chamber of Commerce and Industry (UKPCCI) hosted similar event and succeeded in raising over 1.2 million pounds. President of Chamber Kamran Khan, General Secretary Barrister Mian Waheed, Amjad Khan, in their speeched fully supported the cause of construction of dams. In Manchester event, organised by property tycoon Aneel Musarrat over 2.1million pounds were raised. Similarly, in Birmingham, over one million pounds were raised. Addressing these events, CJP Saqib Nisar said that the construction of dams is a question of life and death for Pakistan and who oppose this vital project are the enemies of the country and Pakistani nation. “Construction of dams is a project which cannot be stopped for the sake of unjustified and non-patriotic approach and elements”, he said without naming any organisation and lobby active within and outside the country. 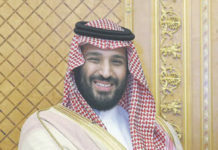 He referred the protest against the dam project that took place outside the Royal Nawab Restaurant on Thursday night when he himself was addressing the fund-raising event inside the building. World Sindhi Congress was the organiser of this demonstration and the participants continued the agitation in severe cold for two hours chanting slogan demanding stop of construction of dams on River Indus. “We are opposing and protesting in Karachi, Hyderabad, Dadu, Mirpur Khas and other cities in Sindh against the constructions of dams on River Indus as the plan is absolutely against the interest of Sindhi nation but no one is prepared to listen to us and our grievances. Despite all odds we shall continue to oppose and protest no matter what may come”, they added. Chief Justice Saqib Nisar was the eye-witness to this protest and the demonstrators raised the slogans with full voice when he reached the venue to address the event. CJP without referring the demonstration said in his speech that no protest can stop the construction and those who are opposing the project should listen with open ears that not only one but several dams would be constructed in Sindh. Chief Justice Saqib Nisar referred this opposition in detail while addressing the similar event in Manchester on Friday night. He said; “Plans for the construction of dams were chalked out 40 years back and I failed to understand why were not implemented. Now after such a long time, I understood the reasons. This opposition and resistance was the only hurdle in construction of the dams. Handful selfish elements don’t want construction of dams but we shall fail their nefarious designs and definitely construct the dams as this is imperative for the country. In order to overcome the looming water crisis, building more dams, including Diamer-Basha and Mohmand, was imperatives. 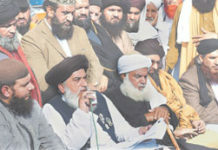 “No one can stop us from building dams in Pakistan on Indus River, as this is in the interest of the country,” he said. “Pakistan’s survival rests in unity of all four brothers (provinces). Construction plan of Kala Bagh Dam was made in 1956 but due to differences, it was not implemented. Still there are differences and opposition over this project so we preferred to construct two dams Mohmand and Diameer Bhasha Dams and I here declare that no one can stop the construction of these dams”, he announced. “Everyone should listen and think that opposing the construction of dams is open enmity to the country and any hurdle, negligence and delay would be counted as criminal activity. Pakistan is suffering lack of water and if these dams are not completed, Pakistan’s condition would be worst than Somalia. Construction of dams demands sacrifice from Pakistanis and they should come forward to play their role and responsibilities”, he emphasised. He warned that water level in Quetta is very low and the people of Balochistan would be compelled to migrate to other areas. He expressed regret that the poor people are contributing every day but those who looted the country and transferred their looted money abroad are not helping at all. “I shall not spare these people who transferred their illegal money through boats (Asif Zardari), made plaza and villas in Dubai and other countries and are not prepared to contribute for the country”, he warned. CJP said that there will be no need of asking the donations and contributions for the dams if the looted money is brought back. This money would be enough for the constructions of dams. I shall make these culprits accountable who are not contributing and had transferred the looted money abroad. CJP Saqib Nisar also stressed on population control and said in next 30 years, Pakistan’s population would be more than 450 million but resources would minimise further. On a light tune, he said “I have advised my children not to produce more than two children. Everyone should follow this advice”. It is worth mentioning that more than £1.9 million were collected at the event and major contribution came through Pakistani entrepreneurs and mosques from various cities. The event was organised by property tycoon Aneel Musarrat, a close friend of Prime Minister Imran Khan, who constituted a committee for this purpose headed by two businessmen Abid Hussain and Iftikhar Majeed. Aneel Musarrat, his wife and daughter presented a shield to CJP Saqib Nisar in recognition to his services for the country and humanity. Pakistan Consul General Ehsan Ullah Batth, Aneel Musarrat, Abid Hussain, M. Raza and other community leaders also addressed the event. The first fund-raising event held at Royal Nawab Restaurant in London on Thursday was organised by the Centre for Policy Dimensions (CPD) Limited, UK and was addressed among others by Deputy High Commissioner of Pakistan Muhammad Ayub, directors CPD Muhammad Shafeeque and Muhammad Sohail Babar, Cllr. Qaiser Abbas. British-Pakistani lords, councillors, diplomats, and Pakistani Diaspora belonging to different walks of life attended the event. The participants contributed Pounds 385,000 in cash and made pledges of Pounds 5 million for the construction of Diamer-Basha and Mohmand Dams. Slogans like Pakistan Zindabad (long live), Chief Justice Zindabad, and Pakistan Army Zindabad were raised by the participants. CJP Saqib Nisar thanked the organisers for holding the event. He said, “Water is a blessing from Allah and essential for life while existence and prosperity of Pakistan is directly linked with the building of dams in the country.” He said that it was heartening to note that an awareness campaign regarding the building of dams to overcome water shortages has developed among the Pakistanis. People, including overseas Pakistanis, youth and children, were also actively participating in this campaign, he remarked. He added that overseas Pakistanis wanted progress and prosperity in their motherland. The CJP said that he had no political motives and after retirement his only motive would be to serve the people of Pakistan. He said that he wanted elimination of corruption, promotion of rule of law, accountability of rulers, provision of good health and education facilities to the masses in the country. He regretted that in the past 40 years, no solid efforts were made for building more dams. 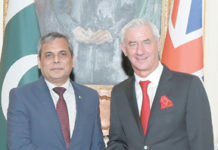 He thanked the British-Pakistani Diaspora for generously donating in the fund-raising campaigns and hoped their support would benefit Pakistan and its people. Deputy High Commissioner Muhammad Ayub thanked the CJP for his initiative terming it as a great achievement. He expressed the hope that British-Pakistanis would come forward and play their vital role in the support of this initiative.